A powerful new feature enabling users to access their supplier catalogues in Sharp-aX and convert them to stock items in Sharp-aX quickly as required. The 3rd Party Catalogue module is designed to allow quick and easy integration of product lists from your suppliers such as Toolbank, RKW and Elektrika. Keep Your Stock File Tidy! Keep your stock file tidy and only copy the stock item when you actually need to sell it. Rather than creating all the stock items yourself simply obtain a spreadsheet of items from your supplier, drop it into a folder and the Module will run a scheduled routine to make it available to view within Sharp-aX. 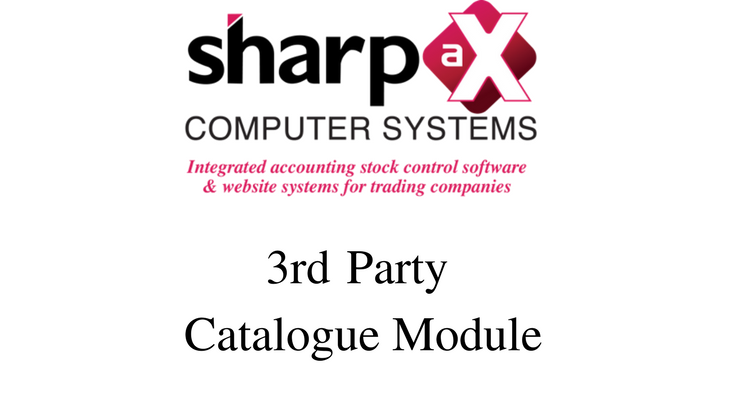 Once the automated import has completed, the entire catalogue is available to view along with any pricing, stock figures and/or other information your supplier includes directly within Sharp-aX. The Module offers a configurable button to add the items you require from the list directly into your main stock file. The open-ended design of the product also allows it to be used for other applications where data needs to be dropped into Sharp-aX and regularly updated. This includes your suppliers’ stock levels of particular products, information from your bank and similar external integrations. Sharp-aX Managing Director Jean Freeman commented: “2017 has seen Sharp-aX launch a series of Modules, in order to make the Sharp-aX software even more powerful and user friendly.